How to reach Ostend ? 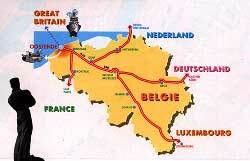 It s very easy to reach to Ostend by car. From every coastal-village by way of the Koninklijke Baan. From Holland by way of Breda - Antwerp - or by way of the Zeelandbrug. Next to a Ro-Ro harbour, which transports lots freight from the Continent to Great Britain, Ostend also takes care, now for over more than a century, of the passenger traffic as well. For over a hundred years the R.M.T. has taken care of thousands of passengers which wanted to cross the Channel. The ferries were named after members of the Belgian royal family such as the  Princes Marie-Christine, the Prins Albert , the Prins Filip Since begin 2003 there is no longer a direct connection between Ostend and Great Britain for passagers. Ostend airport has doubled its capacity during the last few years, this being for both the freight transport as well as the passenger traffic. Even the largest airplanes like the Concorde can land at the airport of Ostend.